Release Message: Dr. Paradigm is visited by his future counterpart in his Time-Slammer where they work on a plan to develop a mechanism to alter the world's genetic code by New Year's Eve. Featuring Andrew Rannels as Streex. Description: Dr. Paradigm is visited by his future counterpart in his Time-Slammer where they work on a plan to develop a mechanism to alter the world's genetic code by New Year's Eve. 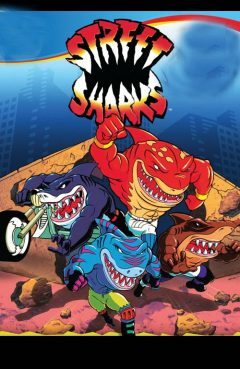 The Street Sharks are tipped off about the disturbance in the time-space continuum by Dr. Bolton and work with Mantaman and El Swordo to thwart the two Dr. Paradigms and the future Dr. Paradigm's Mechosharks.